Margot Wallström, Minister for Foreign Affairs, welcomed the United Nations efforts to reach an agreement on the Cyprus issue and acknowledged the role of religious leaders of Cyprus in the reconciliation process at the Parliamentary debate on Foreign Affairs 2016 in the Swedish Parliament this morning, Wednesday 24.2.16. 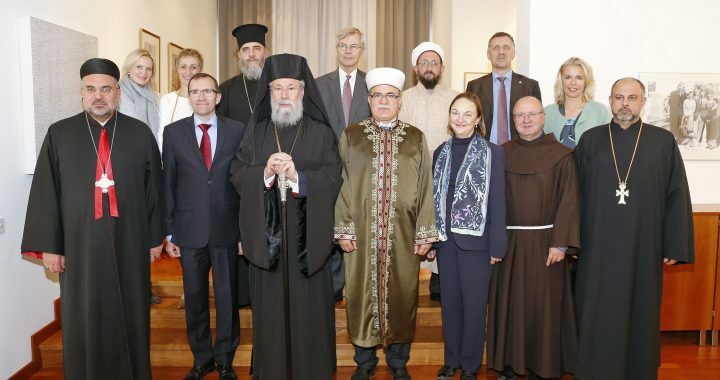 The Religious Leaders of Cyprus and the Office of the Religious Track of the Cyprus Peace Process (RTCYPP) categorically condemn the arson attack against the recently renovated Mosque of Denia, in the Nicosia district. H.B. Archbishop Chrysostomos II of the Church of Cyprus and H.E. Dr Talip Atalay, Mufti of Cyprus and are in contact with one another through the facilitation of the RTCYPP since they heard about the attack yesterday. Both leaders made and released their own respective statements strongly condemning this heinous act. “ We are very saddened by these news. We should rebuild. Not destroy”, said. Rev Father Jerzy Kraj, religious leader of the Latin Catholic community of Cyprus and representative of the Apostolic delegation of the Holy See. Mufti Atalay welcomed the statement of President Anastasiades and the immediate efforts of the government authorities to restore the damage caused by the attack yesterday. The Religious Leaders of Cyprus will be meeting with Mr Espen Barth Eide, the United Nations Secretary General’s Special Advisor on Cyprus and Ms Lisa Buttenheim, Deputy Special Advisor and Special Representative of the UN Secretary General to Cyprus on Wednesday 10 February 2016 at the residence of the Swedish Ambassador Mr Klas Gierow. The meeting is facilitated and hosted by the Office of the Religious Track of the Cyprus Peace Process under the Auspices of the Embassy of Sweden. The religious leaders were briefed on the progress made, and the challenges faced, by the Committee. The Religious leaders praised the work of the CMP and pledged their unanimous support to their important mission. At the end of their visit, the religious leaders also made statements calling on all Cypriots to provide information to the CMP on possible burial sites. “Any suffering of any human being is suffering for the whole world. We should not allow this immeasurable pain to continue. Anyone with information should come forth so that human dignity is restored and the relatives of those missing can find peace and consolation”, said the religious leaders. Following the visit to the CMP laboratory, the religious leaders had a lunch meeting at the Swedish Ambassador’s residence where they discussed the upcoming meeting with Mr Espen Barth Eide, the UN Secretary General’s Special Advisor on Cyprus and Ms Lisa Buttenheim, UN Secretary General Special Representative to Cyprus to be held on Wednesday, 10th February 2016, facilitated by the Office of RTCYPP and hosted by the Ambassador of Sweden.